So today i bought the first parts of my new computer, first upgrade in 6 years so i am just looking to see what people think and what overclocks i could do on it. I have not got all the bits yet and will be using the GPU, HDD and PSU from my old machine for now. Also looking for some advice on setup for the water cooling loop for the RX480's and how i should go about it. Why RX480's over the 1070\1080? If the existing SSD isn't too old, another of the same in Raid0 might be a good idea. Good for performance but twice as bad for data integrity. Skip the SSHD for a games library. They reuqire the same data accessed again and again to know what to 'cache' in their 8GB ssd cache (it operates at block level, so its not file dependant). Since games randomly load things, it'll be of little help. Just grab yourself a 'black' drive, or a velociraptor, and enjoy. Im still tossing between a 1070 or cross fire 480's, I am new to the dual GPU scene and would like to try it out and figure that dual 480's would be the best place to start. The PC is being built to play games like star citizen and games alike. The SSD is one of the older samsung 840's I was looking at something like a Cruical 480GB However i may hold out for now and get something a bit larger. I am not a fan of Western digital, i have had a fair few of their drives fail on me, However in saying that one of the best drives was a WD Blue drive. I normally use Seagate but recently their drives have been pretty crappy aswell. I will look at the Velociraptor drives though. WD Green were source of a lot of the bad rep, they're not made any more (I had a 1 TB fail on me). I've seen at least 2 surveys that show WD above Seagate for reliability and at the least are quieter from the onset. Hitachi actually scored very well, they've been into enterprise computing gear for at least 20 years. If you want reliability HGST drives then; cheap and flawless. No way i'd put Seagate over WD... ever. Was looking at them aswell. Now would 16gb ram be enough on most new games? I know star citizen recommends 12GB and ark survival just loves all the ram you throw at it. Should i look at 32gb? 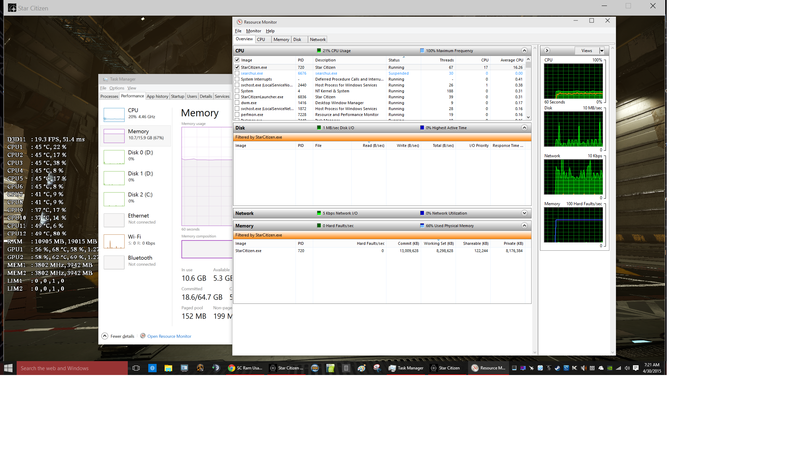 Despite the current recommendations I'm yet to actively see a game take more than 8GB of ram. 16GB is more than enough. Thanks, Will posts updates here or ion the overclocking forums on how i go with the i7. Good to know that im getting advice from a fellow SC player. I have not played much SC due to pc just dying under load on it. The old amd phenom 2 x4 955 with 8gb ram does not hold up well playing it. Would love to catch up in game one time once im all setup. Has the failure rate over the years and the drive type. HGST has amazing failure rate besides the 4tb version. WD bought them not long ago. They're still assembled in their original factory, afaik. I have been leaning towards samsung drives in recent years, have had fairly good success with them, My other big issue is these drives may be great in the cooler places, but up here in the NT nothing seems to last. Enterprise quality, identical to enterprise, just cheaper because they dont give the 5 year warranty. I live in Darwin, well you know what crap weather we get. Never had hard drives overheat, but video cards and CPU are the things that tend to die quick here. I'd always opt for a big single card over dual lesser cards, from what I've read, you need to overclock those rx480's to beat out a single 1070, but remember dual cards will be worse in many games and better in others, but always have worse frame timing etc. I'll repeat myself just because. True enterprise drives, but cheap because 'standard' warranty. You want "the best" quality\odds of error free use? REDs. Yeah, Will be getting 2 of the WD red drives Probably 2 6TB's for movies, Tv shows etc And a WD black 2TB for all the games. Honestly these days you are just better off going with the best single card you can afford as you will have less hassles. Not all games are optimised for multi-GPU set ups and unless you are running games on a very high res monitor or a decent multi-monitor set up then you really don't get much benefit out of multi-card setups. Just wondering what is the native res of your monitor? I have 2 of these running on 1920x1080 Mainly because they are the cheapest 24 inch i can get locally.